The U.S. Coast Guard has seized 34,780 pounds of cocaine from apparent drug smuggling vessels in the eastern Pacific Ocean. The drugs, seized in 21 separate operations conducted by six Coast Guard crews over the past three months, were off-loaded on Tuesday at Port Everglades in Fort Lauderdale, Florida. The drugs were found aboard fishing vessels and go-fast boats outfitted to conceal contraband and evade authorities, said Cmdr. Michael Sharp, the commanding officer of the Coast Guard cutter Forward. The stops were conducted in Pacific waters off Mexico and Central and South America. Sharp said the drugs had a wholesale value of roughly $466 million. Photos released by the Coast Guard show how smugglers concealed drugs in secrete compartments below deck, or jettisoned huge bales of the drugs overboard as Guardsmen approached in a bid to escape. On Tuesday morning, the Forward, a 27-foot medium endurance cutter homeported in Portsmouth, Virginia, brought the more than 17 tons to shore at Port Everglades. 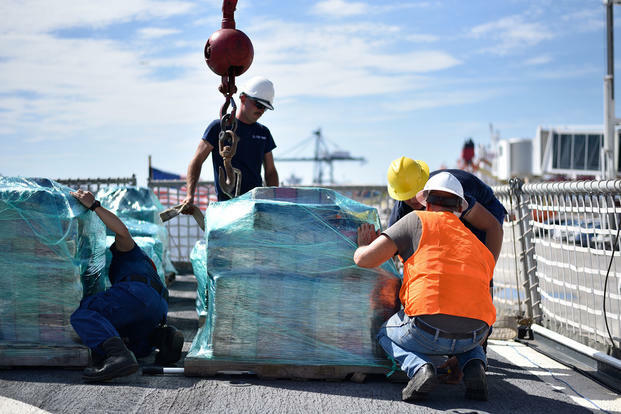 Bales of the drugs were piled high on the deck of the Forward as it was greeted by Coast Guard officials at the seaport on Tuesday. The Forward was responsible for eight of the 21 interdictions, seizing an estimated 14,207 pounds of cocaine. The Coast Guard Cutter Confidence was responsible for one case, seizing an estimated 553 pounds of cocaine. The guard’s commandant, Adm. Karl Schultz, said in the last few years, crews have seized 1.3 million pounds of cocaine and detained 1,200 suspects at sea.